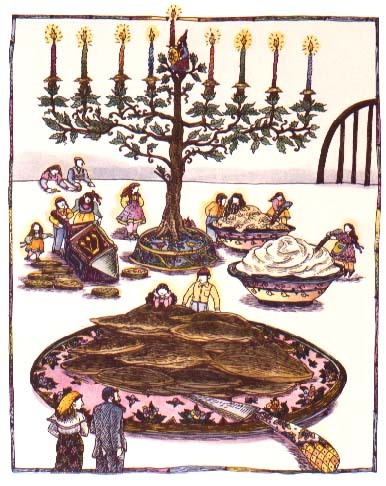 In Latkeland, Mother and Father share the light and joy of Chanukah watching as their children play happily on the family table, transformed by imagination into a landscape of decorative holiday dishes heaped with golden brown potato pancakes (latkes), rich sour cream and savory applesauce. 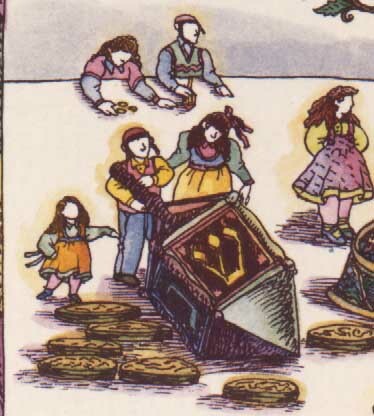 As the ancient story is read and the Chanukah gelt (money, or chocolate coins wrapped in foil) is exchanged with each revolution of an enormous dreidel, so the cycle of celebration continues throughout the generations. And above it all, perched atop the magically flourishing menorah, Judah Maccabee wields his brightly burning candle and shield, enlightening and guarding the Children of Israel.